Withdrawn, uneducated, and unloved, Frederick collects butterflies and takes photographs. He is obsessed with a beautiful stranger, the art student Miranda. When he wins the pools, he buys a remote Sussex house and calmly abducts Miranda, believing she will grow to love him in time. Alone and desperate, Miranda must struggle to overcome her own prejudices and contempt if she is understand her captor, and so gain her freedom. 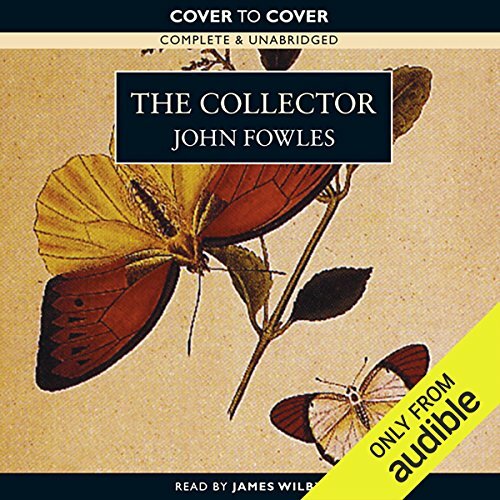 ©1963 John Fowles (P)2014 Audible, Inc. It's a powerful story of obsession and delusion. The perpetrator seem to see himself as the victim. I suppose he was the victim of a delusional mind. Hats off to James Wilby for his wonderful narration. The story starts out creepy & stays that way right until the end. John Fowles has done a brilliant job of creating these characters, particularly Frederick, who seems as though he ought to be as harmless as the butterflies he collects - but who is anything but. "Gripping" would be a good adjective for this one. It is a remarkably well written story, my favourite so far of the Fowles books available on the Audible book store. It's compelling from beginning to end. The Collector is one of the best first person books I've listened to. The narration is fantastic. The main character is painted with such clairty, creepy, chilling, fantastic book. This book is made up of the parts, first and last is through Ferdinand's perspective and the second is told by Miranda. I enjoyed the first section; however, having to listen to Miranda drone on and on and on was quite monotonous. Regarding the narration. Again, I enjoyed Ferdinand's character, Miranda was a bit whiny...and when there were two male characters at once, I really couldn't keep up with who was speaking. Overall, our was a just okay read for me. What did you love best about The Collector? This is a masterpiece of a first novel. Bizarre and powerful. A compelling portrait of intriguing self-delusion. Which character – as performed by James Wilby – was your favorite? Wilby slips into the role so effortlessly that one easily forgets that it isn't actually Ferdinand Clegg telling the story. Wilby should be nominated for an award. I loved this novel of obsession, passion and control. While at the plot level it seems like (what now is a basic, but when it came out was revolutionary) psychological creep thriller (see Criminal Minds, Law & Order, Misery, etc. ), this novel is much, much more. It is an exploration and a nuanced look at class struggles, art, power, religion, money, etc.). It is a novel that resonates on several levels. It reminded me of a some weird love-child of Vladimir Nabokov and Thomas Harris. But, perhaps that is just the whispers of all those moths and butterflies talking to me. The narrator bugged at times, but overall did a good job. The performance was so challenging to listen to. Story grim with very little suspense. Story told in first person did take some getting used to. I suppose that was the only aspect which kept me engaged as long as it did. The writing was great, the tangents about the older artist friend slowed down the action considerably but nicely juxtaposed two types of predator. I was expecting much more scare, although the last chapter is authentically chilling. I have no idea what Fowles's intentions were with this acclaimed book, but I only enjoyed listening to half of it - the bad guy's half. This may have been a reaction to the narrator's OTT reading of the victim. It had me rooting for the bad guy. Maybe that was Fowles intention. I don't know and what seemed to me as mostly a college dissertation certainly didn't make me care.